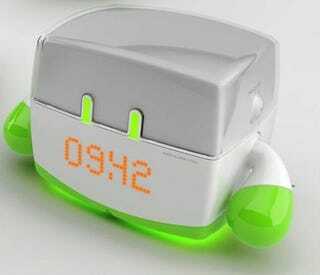 Hasbro's Room Tech Clock, which looks like a mix between an iPod and a Goomba, is an alarm clock with a wireless link to the shroom-shaped Room Tech Lamp. When the alarm goes off, two things happen; the alarm clock will either stomp its fists on the table making an awful racket, play back the radio or pump out tunes from a connected MP3 player. Secondly, the Room Tech Lamp, which is styled like a shroom-Martian hybrid, will be activated, bringing illumination to your dank, dingy room. The Room Tech Lamp has a touch sensitive domed head, which allows the user to turn the light on, as well as select from a variety of colors simply by touching it. Additionally, the lamp has a speaker built in that can be hooked up to your MP3 player. The Room Tech duo are due out in September and will retail for £39.99 ($79) each.